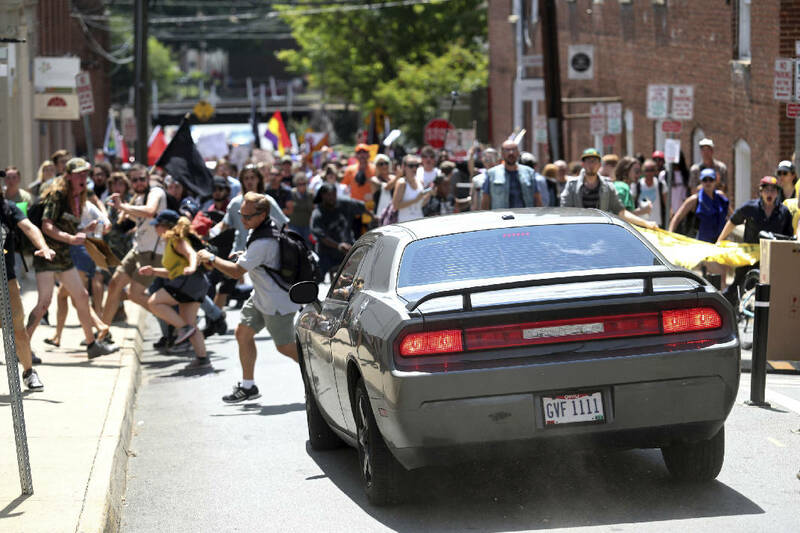 CHARLOTTESVILLE, Va. (AP) — A car plowed into a crowd of people peacefully protesting a white nationalist rally Saturday in a Virginia college town, killing one person, hurting dozens more and ratcheting up tension in an increasingly violent confrontation. A helicopter crash that killed the pilot and a passenger later in the afternoon outside Charlottesville also was linked to the rally by State Police, though officials did not elaborate on how the crash was connected. The turbulence began Friday night, when the white nationalists carried torches though the university campus in what they billed as a "pro-white" demonstration. It quickly spiraled into violence Saturday morning. Hundreds of people threw punches, hurled water bottles and unleashed chemical sprays. One person was arrested in connection. Trump says he's spoken with the governor of Virginia, Terry McAuliffe, and "we agreed that the hate and the division must stop and must stop right now." Right-wing blogger Jason Kessler had called for what he termed a "pro-white" rally in Charlottesville. 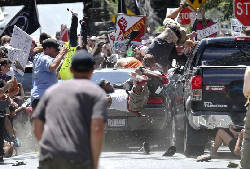 White nationalists and their opponents promoted the event for weeks. It's the latest confrontation in Charlottesville since the city about 100 miles outside of Washington, D.C., voted earlier this year to remove a statue of Lee. Charlottesville, nestled in the foothills of the Blue Ridge Mountains, is a liberal-leaning city that's home to the flagship University of Virginia and Monticello, the home of Thomas Jefferson. 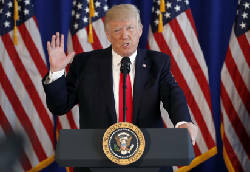 Associated Press writers Alan Suderman in Richmond, Virginia, Heidi Brown in Charlottesville, and Claire Galofaro in Louisville, Kentucky, contributed to this report.